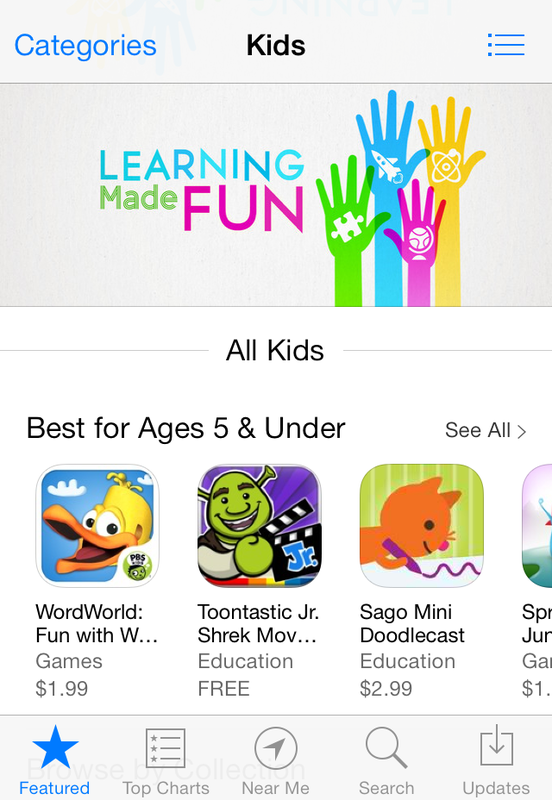 The App Store has always featured these educational (and some not-so-educational) kids apps in the store, but they were never in a child specific category, rather, they would be listed in the “Games,” “Education” or “Entertainment” categories — mixed together with non-children specific apps. However, the tech giants in Cupertino, Calif., made a statement last week by creating a “Kids” category in their signature marketplace. This might not seem significant to some people, but Apple is sending the message that they are paying attention to the kids market, and they intend to support it by providing a better way for parents to find the right app for their children. The category is broken down into sections: five years old and under, six-to-eight and nine-to-11. It stands to reason that Apple created these sub-categories to help parents and teachers find apps that fit their children’s needs. There have been hundreds of stories of school systems implementing educational apps in their curriculum, and even if they can’t provide parents with mobile technology, it’s very common for teachers to recommend educational apps to parents whose kids need extra help. With that being said, there’s no doubt that app developers have already thought about the new category and the way it has been broken down. Successful developers and their teams study every aspect of the market they’re about to enter. Now the App Store has provided some guidelines. If someone is working on an educational app, they need to make sure the graphics, content and story fit in one of the three molds the App Store has set. An app with animation for pre-schoolers shouldn’t contain pre-algebra for 10-year-olds. We all know technology is a copycat’s game. Apple has embraced the kids genre, so it’s safe to assume that other major brands and companies will follow suit and raise the bar for the next wave of apps. But that doesn’t mean indie developers should be scared of the big boys. As I write this, “The Human Body” is the top free app in the App Store. The app isn’t backed by Rovio, Disney or some other monster brand name. It was created by TinyBop — a team of indie developers from Brooklyn, N.Y. The app has already made a splash in the NYC tech meetup scene, as it has received rave reviews at a few events around the city. The mobile app world innovates as fast as any industry in the world, and it will be interesting to watch how the kids genre evolves, as the new category is certain to be a high-traffic area in the App Store.